Heat oven to 425 degrees F. Place the salmon in a shallow baking dish. Season with salt and pepper. In a small mixing bowl, combine the maple syrup, whiskey, mustard, lemon juice and chopped dill. Mix well and spoon over the fish. Bake for 12 to 15 minutes, or until the fish begins to flake slightly. Divide the salmon among four plates and spoon the pan juices over. 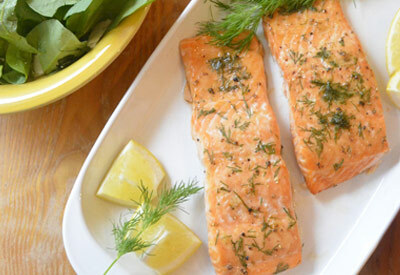 Garnish with dill sprigs and lemon wedges.